Life Extension Mix 315 Tabs Life Extension Mix Tabs 315 tablets Giant Size Bottle from the Life Extension Foundation. LEF has a 27 year history of introducing life saving medical discoveries and funding scientific research. Next Generation” Pomegranate Fruit Extract. Many products on the market contain pomegranate standardized to ellagic acid – a potent antioxidant. However, subsequent research has shown that ellagic is not the most biologically active and absorbable polyphenol in pomegranate. Punicalagins are the new “shining star.” The ellagic-acid based extract in Life Extension Mix has now been replaced by a high potency punicalagin-based extract. Higher Potency Green Tea. The new Life Extension mix now has the highest potency green tea available with higher levels of the important EGCG. The new Life Extension Mix provides 325 mg of a decaffeinated green tea extract that is standardized to contain 98% (318.5 mg) of polyphenols and 45% (146.25 mg) of Epigallocatechin gallate EGCG) which scientists attribute to green tea’s health benefits. Life Extension Mix is also fortified with fruit extracts such as bilberry, grape seed, grape skin, and citrus bioflavonoids to provide healthy circulation throughout the body and maintain healthy DNA.The media has publicized the multiple benefits of fruits such as blackberry, cranberry, elderberry, cherry, plums and persimmon. In addition to these new changes, the Life Extension Mix still contains classic ingredients such as:Vegetable extracts.Luteolin is a flavonoid found in parsley, artichoke, basil, celery and other foods. When measured against 27 other flavonoids, luteolin provided the best DNA protection. One favorable mechanism of luteolin is its ability to inhibit oxidative damage to cellular DNA. D-glucarate is a botanical extract found in grapefruit, apples, oranges, broccoli and Brussels sprouts. D-glucarate effectively supports a detoxification process that helps to remove DNA toxins from the body.14,15 The daily dose of Life Extension Mix provides 200 mg D-glucarate.Lutein, an extract found in spinach and collard greens, has been shown to help maintain critical pigments in the eye macula, while the carotenoid alpha-carotene has demonstrated antioxidant activity far grater than beta-carotene. Lycopene from tomatoes has shown potent effects in helping to maintain healthy DNA structure and protect against LDL oxidation. Life Extension MixTM contains 60 times more lutein and 10 times more lycopene compared to Centrum®. Most multivitamin supplements provide no vegetable extracts whatsoever.Fruit extracts.Life Extension Mix is also fortified with fruit extracts such as bilberry, grape seed, grape skin, and citrus bioflavonoids to provide healthy circulation throughout the body and maintain healthy DNA. * The media has publicized the multiple benefits of fruits such as blackberry, cranberry, elderberry, cherry, plums and persimmon. Life Extension Mix has a customized blend of these and other fruits that studies indicate provide multiple favorable effects in the body.Sesame lignans increase the anti-inflammatory index of fish oils and help maintain healthy cholesterol/LDL levels in those already within normal range. *28-31 Life Extension Mix contains 10 mg sesame lignan extract to provide the direct benefits of the lignans and augment the effects of vitamin E and other nutrients in the body such as gamma-tocopherol and gamma-linolenic acid (GLA). NO RISK GUARANTEE. Our no questions asked money back guarantee allows you to improve your health with ZERO risk. If you don’t like our Turmeric simply ask for a refund! 12 MONTHS FULL SUPPLY – Our incredible 365 capsule bottle gives super VALUE keeping you replenished with Turmeric for a FULL YEAR. No need to remember to reorder every month with 52 week supply. ONE A DAY – One easy to swallow capsule a day to give you a healthy daily Curcumin dose. HIGH STRENGTH! VIP Health’s Turmeric Curcumin has 500mg of root extract packed into each and every capsule. This is double the strength of many brands. As with all VIP Health products we offer market leading formulations. Our Turmeric Capsules are 500mg, twice the strength of many competing brands. We also give you superb value with a convenient ENTIRE year supply – 365 capsules! And let’s not forget our no questions asked money back guarantee. The risk is all ours! Why Buy Turmeric Capsules from VIP Health? * HIGH STRENGTH FORMULA – Our 500mg Turmeric Capsules are double the strength of many competitors’ products. Many competitors advertise a high dosage but that is for 2 or 3 capsules – VIP Health offers 500mg in each capsule. * 12 MONTH SUPPLY – Amazing value, with one order you have all your Turmeric needs covered for a full 52 weeks! * UK PRODUCED – Produced to the highest GMP manufacturing standards in the world. SUGGESTED USE: Food Supplement. Take one Turmeric Capsule per day with food and water. INGREDIENTS: Turmeric Powder, Bulking Agent (Microcrystalline Cellulose), Capsule Shell (Gelatine [Bovine]), Anti-Caking Agent (Magnesium Stearate). BUY WITH CONFIDENCE – Nutravita is a well established UK brand, trusted by customers all over the World. Everything we manufacture is made right here in the UK using the highest purity ingredients and safeguarded by the highest manufacturing standards in the world (GMP, BCR & Certified Organic by the Soil Association). 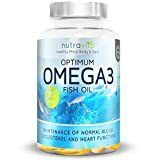 1 YEAR SUPPLY – Nutravita’s Optimum Omega 3 offers amazing value for money giving you 365 day’s supply of the essential nourishment your body needs to work at optimum.